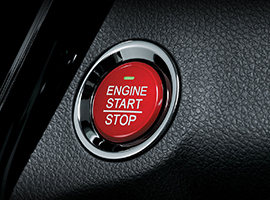 Give your pony the luxurious convenience of Passive Keyless Entry & Push Button Start! 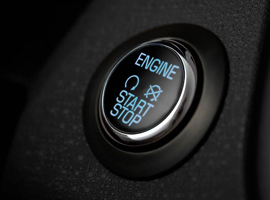 The new iKey-M will add the same Keyless Access and Keyless Ignition operation found on the latest model Mustang’s to any 2010 – 2014 model. It’s never been simpler to add latest in RFID Keyless technology to your Mustang, This exciting new product provides you with everything you’ll need for a painless, easy to follow DIY installation that will make your keys, “A thing of the Past! The iKey-M uses advanced RFID (Radio Frequency Identification) technology from Texas Instruments®, to provide you the ultimate in convenience and protection. 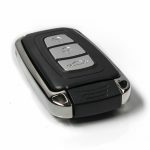 No more frustration from searching or fumbling around with keys or remotes to enter and start your car. 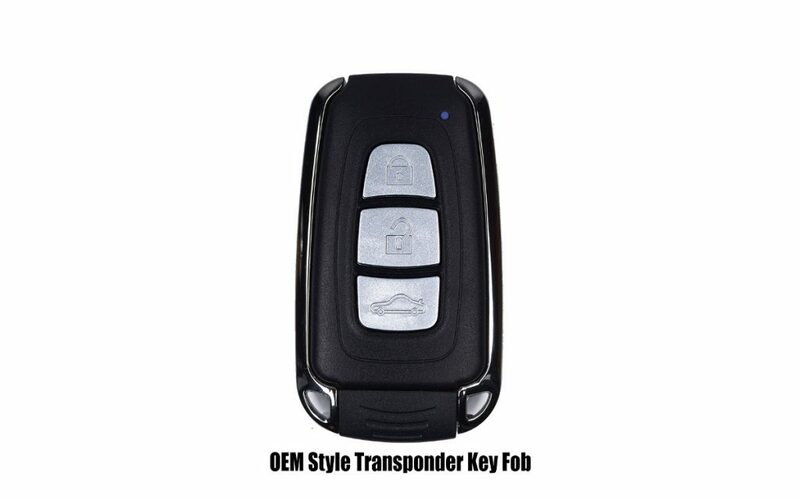 You simply place one of the systems OEM styled RFID key fobs in your pocket, as you approach your Mustang, your doors will automatically unlock and the systems elegant Start Button will illuminate. Climb inside and you’re ready to go, with just a push of the Start Button your engine roars to life! Exit and you just walk away . . . . As you leave the systems frequency range, your doors will automatically lock and iKey-M’s advanced two-stage security system will self-arm leaving your Mustang securely protected. With the iKEY-M it’s Impossible to forget to protect your vehicle! 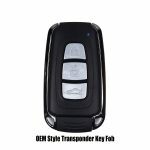 Made with high quality factory grade components, the iKey-M includes an OEM style Key Fob, lighted factory style Start Button and Emergency backup vehicle access card. 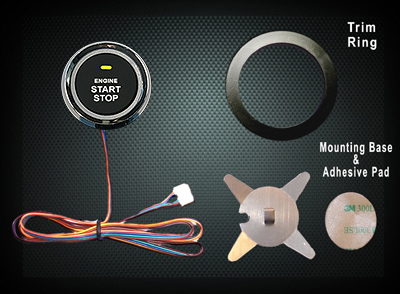 Our innovative plug & play “T” harness uses factory connectors to interface directly with your Mustang Ignition system and allows even someone with modest installation experience to dress up their pony with this exciting accessory. Exquisitely designed to be both stylish and functional, the iKEY-M OEM fob provides fully automated operation of your vehicle’s doors and ignition in a sleek, elegant package. A quick glance is all that is needed to appreciate the fine craftsmanship that went into this advanced design. Its rugged high impact housing is surrounded by a rich band of heavily plated chrome giving it a sophisticated upscale appearance. The elegant chrome banding also features two eyelets for attaching your fob to an existing key ring if desired. The soft textured finish feels luxurious. You’ll feel like a VIP when you experience its completely “Hands Free” convenience! 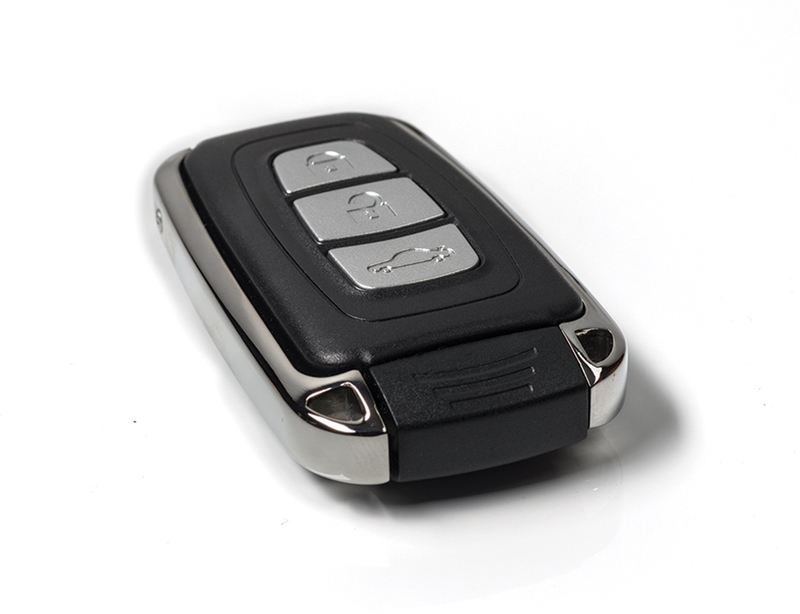 The OEM fob also features 3 “soft touch” buttons which provide you the added convenience of Remote Trunk Release, plus extended range lock and unlock, just like your original factory remote. 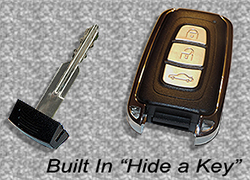 The iKEY-M fob’s also provides ‘Lock Out” protection even in the event of a dead car battery. 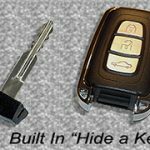 Its innovative design incorporates a hidden compartment inside the fob to insert a “Hide a Key” blade for your door locks, assuring you’ll never be locked out of your vehicle. 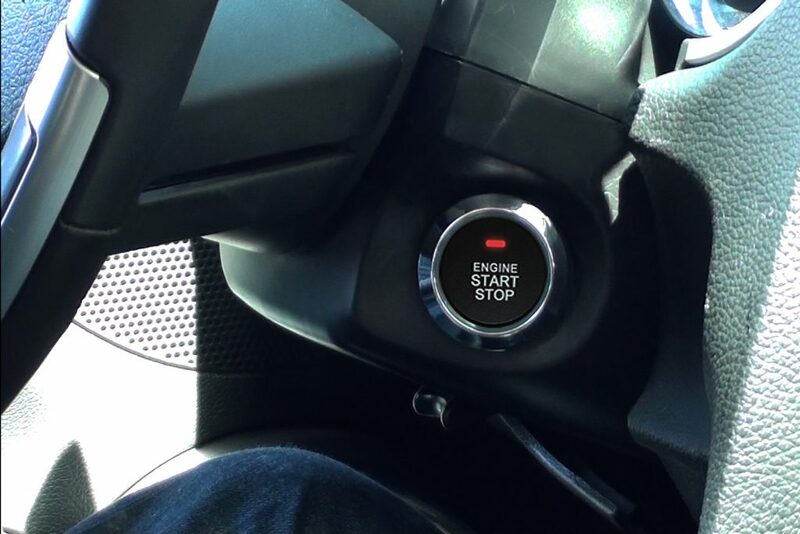 Our contemporary styled Start Button adds the perfect finishing touch to your keyless Mustang install. Dual color Led’s provide beautifully illuminated backlighting as well as informed you of system status. 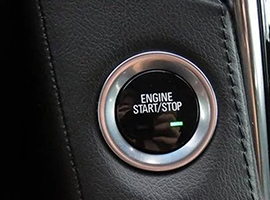 Specially design to mount right over your Mustang’s existing ignition switch; this elegant Start Button delivers the convenience of one touch starting with a factory finished appearance. iKEY-M will give you visual confirmation that it has armed or disarmed by flashing of your parking lights when you approach and exit. If you accidentally leave a door OPEN when you leave your vehicle, iKey-M will alert you with three quick flashes and siren chirps as you walk away from your vehicle. 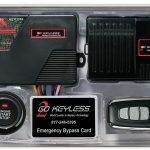 Should you ever lose or damage your Key fob, the system includes an Emergency Backup Transponder Card to always guarantee you access to your vehicle. Just hold the Bypass Card next to your windshield for 6 seconds and doors will unlock and you will be able to start your engine. This is the same “passive transponder” technology used for access of high security buildings. 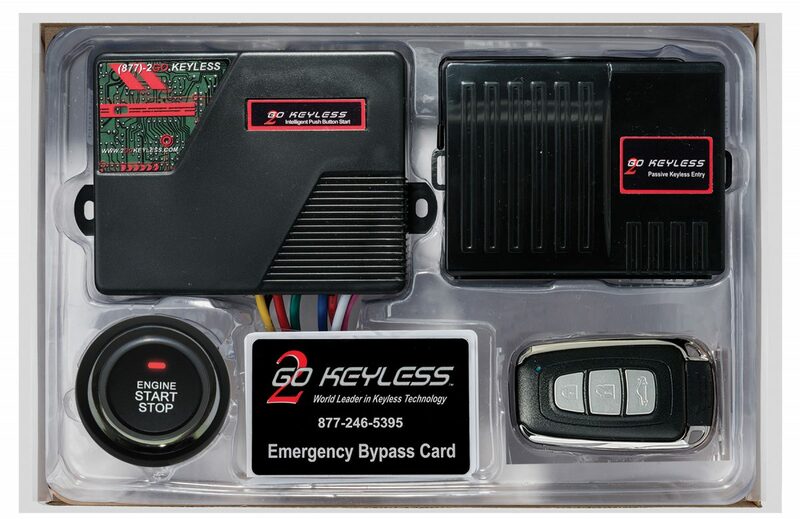 Emergency Bypass Cards are completely waterproof and use no batteries making them perfect as a backup access device. Another Exclusive iKey Feature! 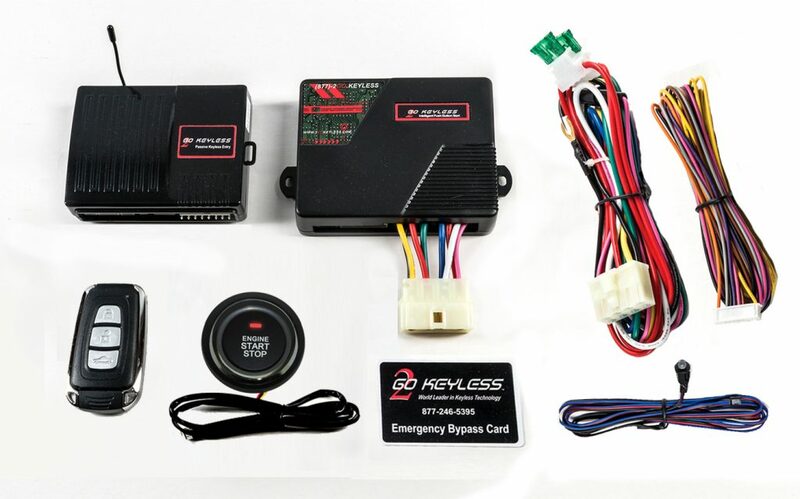 Your Mustang already has two valuable security features from the factory; “Intrusion monitoring” and a transponder security “chip” in the existing key. The iKEY-M integrates with both these systems. It provides automatic arm and disarm of your Intrusion monitoring as well as a factory bypass module that allows you to go Completely Keyless without sacrificing these valuable factory security protections. Will I need to cut any wires? You will not need to cut any wires, or do any soldering. All wire connections are done with either factory connectors or quick snap connectors. Will I need any special tools for the install? The install is designed for your typical DIY type of person, you will not need any specialty tools for this install. 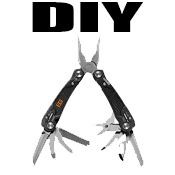 The install is designed for your typical DIY type of person, everything you will need is included in the kit, you will need to make a quick trip to your local hardware store to have them cut the key we have provided to match yours for the vehicle. Simple Answer: The unit is stuck in “Run” mode, walk it through a shutdown sequence to reset the unit, to fix it press and hold the brake, press and hold the start button for about 1.5-2 seconds and everything will shut down. Long Answer: The system is very sequence oriented since we do not monitor a Tach signal. The system was at some point walked through a start sequence, so the module believes the engine is running, to fix it press and hold the brake, press and hold the start button for about 1.5-2 seconds and everything will shut down. Make sure your key is snug in the bypass module, ensure there are not any cuts or breaks in the antenna wire going up to your keyswitch. 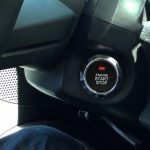 If when you depress the brake the start button DOES NOT blink, check your brake wire connection, our small gauge brown brake wire needs to receive 12Volts when the brake is depressed. We recommend changing your batteries once a year, the batteries must have a voltage of no less than 3.0Volts. If the batteries are at 2.99Volts they are no longer a good battery, you will experience a decrease in range. If they ikey system does not detect use in 5 days it will reduce its range to preserve battery life, every 5 days the system will reduce its range to preserve the life of your battery. This is the system telling you that your vehicles battery is low, the ikey system requires your vehicles battery to be at 10Volts in order to operate correctly, if your battery is below 10Volts the system will restart itself. The ikey LED will blink Red-Blue-Red-Blue even while you are inside the vehicle. Make sure the antennas are plugged in correctly and that you did not accidentally plug in the bypass antenna into the main antenna harness, Ensure that the antennas are not touching metal. Do NOT wrap the antenna wires around a bunch of other wires, this will cause a reduction in range from interference. 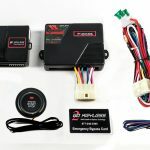 (1) 556U Bypass Module (1) Plug N Play Harness for Ignition, Accessory and Start Connections (1) Hardware pack for easy installation.